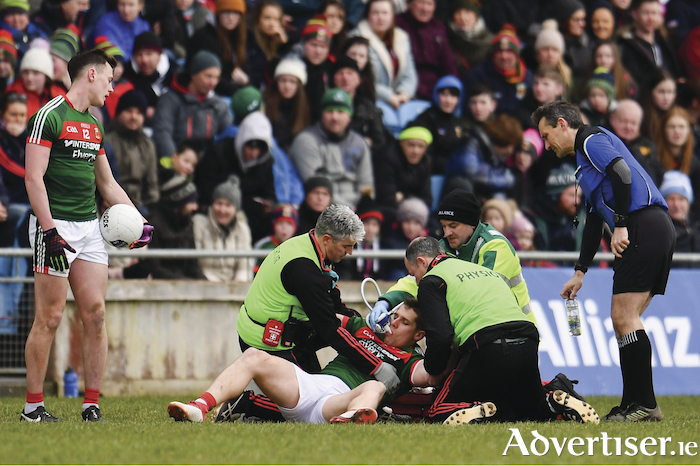 Big concern: Lee Keegan's injury is major blow to Mayo and will be a big concern going into the championship. Photo: Sportsfile. As far as Mayo GAA football days go, last Sunday in Elverys MacHale Park will probably rank as one of the worst, particularly for this bunch of players. The performance, the manner of defeat, the magnitude of the defeat, the number of unforced errors and the indiscipline was only compounded by two serious injuries to Cillian O'Connor and Lee Keegan. Both players are going to be out for a while. Looking at Cillian O'Connor after he had come off after a hamstring injury would suggest it was of the serious category as he was limping heavily and was aided by a crutch. The injury to 2016 footballer of the year Lee Keegan was sickening. My heart sank as he writhed in agony on the ground. Tom Parsons' slightly overcooked hand pass had Keegan stretching for the ball, exposed and open to get absolutely nailed by Tyrone's Padraic McNulty who deservedly received his marching orders. The first half was as bizarre a contest as I have ever been at. The pitch was reminiscent of an Saharan desert such was the amount of sand on it. It proved to be very difficult to play on especially for Mayo anyway. Any time a player went to ground a puff of sand rose from the turf which could only have been a hindrance for the players. The sand however cannot be blamed for the number of times Mayo players lost the ball in tackles or kicked the ball harmlessly away to their opponents. You could sum up the first half simply in twos — two red cards, two black cards, two stretchers and two ambulances. Behind the stand at half time was like a scene from a war movie as I watched Lee Keegan and Tyrone’s Hugh Pat McGeary being whisked off through the throngs of supporters to the Mayo General for urgent attention. From Mayo's performance point of view there were not many highlights. Colm Boyle's over enthusiasm ensured he received a second yellow card, Maurice Deegan really had no choice. Andy Moran was issued with a black card for challenging a decision by the Laois whistle-blower. Initially I thought Moran's action had changed Deegan's mind until I saw the black card raised above his head. So in the first half alone, on top of an already depleted squad, Mayo lost four crucial players in Cillian O'Connor, Lee Keegan, Colm Boyle and Andy Moran, all game changers on their day. This was Mayo's third home loss in this year's National league out of three, a damning stat if you have notions of progression or stability. After Tom Parson's early point for Mayo it took all of 38 minutes for their second score as Conor Loftus pointed two injury time frees to leave it 0-8 to 0-3 at the interval. Tyrone scored seven points on the spin to leave them 0-8 to 0-1 ahead, before Loftus' late frees. Mayo did score the first point of the second half in what proved to be a false dawn but Tyrone duly responded and by the 20th minute of the second half they hit 1-5 on the spin to all but kill the game as a contest to leave them 1-13 to 0-4 points in front. The large home crowd had started their evacuation at this stage. Tyrone's Mattie Donnelly had a very commendable afternoon scoring four points from play from midfield while dictating the afternoon's proceedings in the process. I'm not going chasing through the record books but I thought I'd never see this Mayo team beaten by double figures, maybe Dublin did it a few years back in a league game? With a skeletal squad, Mayo are going to have to find something from somewhere for Ballybofey next Sunday to maintain our proud 20 year stay in division one. Confidence is low there is no question and with Lee Keegan and Cillian O'Connor added to the list which includes Brendan Harrison, Donal Vaughan and Evan Regan, maybe a return for Chris Barrett who came through a club game last weekend or Keith Higgins is what's needed as a confidence booster for the trip to Donegal for the do or die game. Higgins will surely be on a high after his brilliant hurling exploits. Donegal haven't exactly set the place ablaze with their performances either with only two points to show for the first six rounds. That victory came after defeating 14 man Kildare in round four. This game will have huge implications for Mayo, losing is not an option. The large home crowds and tremendous away support will dwindle if Mayo find themselves in division two for 2019. Hair and skin will fly at this one. It's time for our big game players to show their true worth. It won't be for the fainthearted. This will be a huge victory if Mayo can pull it off. I'll be joining Jacqui Hurley live from Ballybofey for Radio One for the big game. Both teams are priced at even money with the draw at 15/2. Following on from what I mentioned a few weeks back about managers naming dummy teams and making wholesale changes to starting line ups before throw in, Tyrone have taken it to a new level after last Sunday. Not only did they make wholesale changes to the team named, up to eight of their players didn't have their correct numbers on from the match day programme rendering the programme almost useless and many struggling to keep a tab on players' performances and what they scored. That's not fair on supporters or the hard working officials who put these programmes together.